Art in Context – iDallas! The Washington Post did an insightful experiment where a world famous concert violinist performed unannounced at a Metro station in Washington DC at rush hour. If you’ve ever been in an urban environment for much time at all you’ve no doubt seen street performers. In my experience the vast majority of them are completely ignorable. I do still try to give them a few seconds of ear as I pass though, just in case. It’s enlightening to see what happened in this real-world experiment! Now that you’ve read the article… it brings up the idea that it may only be really possible to appreciate art in the proper context and environment. That even totally beautiful and amazing art may be overlooked and unappreciated if viewed from the wrong mindset or perspective. That makes sense to me. It also makes me think of the role of art as a concept and idea in our daily lives. We’re inundated with pseudo-artistic advertising so much that we can become trained to block it all out, especially while on our daily commutes. We’d go crazy otherwise. The difficulty is in knowing when to open up the blinders a little bit when there’s something worth experiencing going on. It seems that all too often that just doesn’t happen. 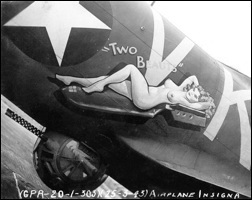 As a side note, this picture of nose art on the front of a World War II airplane makes me think, too. It probably falls under the pseudo-artistic category due to its relative lack of quality but it also is such an icon of American culture that you just can’t ignore it. Fortunately, noone can say what is art and what is not. Unfortunately, noone can say what is art and what is not. That’s the problem (if there is) and the solution. Dallas, contact my email and let me prove my skills in the hosting business. Lack of quality wasn’t a detraction during the times that this sort of art evolved. Think of the conditions it was created in, and the plight of the men that were there, and you may come to the realization that it was good, meaningful, and served a greater prupose.